In June 2016, I went on a trip to Iceland. 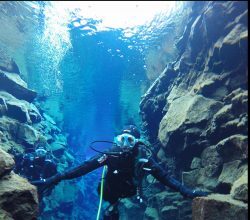 The overwhelming highlight of the trip was having the opportunity to dry-suit dive at Silfra. 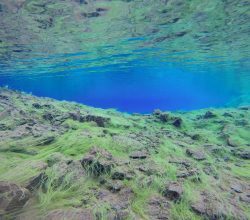 Before visiting Iceland an intrepid friend of mine had told me of her adventure fresh-water diving between 2 tectonic plates in Iceland. Instantly I was sold! The Silfra fissure is located about 40mins away from Reykjavik in the Thingvellir national park, and is essentially a chasm in the earth between the Eurasian and north American continental plates. 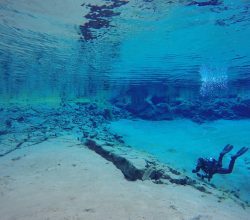 It is one of the most unique dive sites in the world because a) you can dive this fissure right where the plates are moving apart at a rate of approximately 2cm/year, and b) the visibility is the clearest of any site in the world. Touching Silfa’s opposing tectonic plates. The reason the visibility seen in the above photo is so good is because the water is freshwater and not salt, and in addition the water is from melted glaciers that has seeped over many years through porous volcanic rock (thus acting as an incredible filter) before it even reaches the fissure. The result is over 100m visibility, and mind-bending reflections seen on the under-surface of the air-water interface when you look back up above you. The water is so pure you can drink it (it tastes amazing!). The temp was a cosy 3 degrees Celsius hence a dry-suit was necessary for this dive. Although there are trout in the adjoining Thingvellir lake, they rarely venture into the Silfra chasm, and hence the dive is not about visualising aquatic life, but rather the incredible visibility, the intensely fluorescent green “troll hair” weeds, and the incredible colours and refraction of light that occurs under the water. The Silfra dive isn’t particularly deep, we averaged 7-12 metres, however not much is gained from going deeper anyway as there is little marine-life there and for those without their PADI dive licence, you can also snorkel the Silfra site following the same dive trail but from above, and due to the astounding visibility, the snorkeler friend in our group experienced the same breathtaking effects and said he would recommend it to anyone and everyone! We dived with Hedinn Olafsson (www.diveiceland.com) the most experienced Silfra diver in the world, and he is very experienced at taking divers on their first dry suit diving experience at silfra, and would recommend him to anyone due to the excellent communication, attention to safety and calm clear guidance throughout the experience – so if you’re looking to have your own Silfra diving experience, look no further.